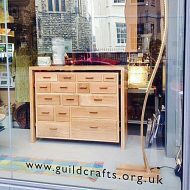 The Gloucestershire Guild of Craftsmen has a long tradition of furniture makers from its formation in 1933. 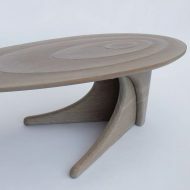 To celebrate the continued practice and development of furniture making, three of the Guild’s current furniture makers, Kristian Pettifor, David Ian Smith, Matthew Tradgett, will be making new work for a ‘room set’ within the Guild at 51. As designers, they each employ different techniques and interpretations of contemporary pieces for the home. As well as raising awareness of private commissions through the Guild at 51, the Home Sweet Home exhibition has provided Kristian Pettifor with the time out to explore unanswered questions within his discipline. The technical making processes Kristian will explore are surface relief, shadow and the graduation of tone with his signature finish. 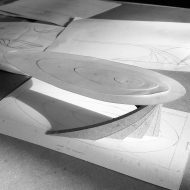 These resolved technical processes in craftsmanship can then be applied to a broad range of objects with future commissions. The low table designed for the exhibition has a pure organic form and visually plays with balance and structure. From mighty ships to tiny jewellery boxes, Oak has been the backbone of traditional woodworking for centuries and to celebrate its beauty within the home, David Ian Smith has produced a chest of drawers that blends Japanese styling with both traditional and modern woodworking techniques. Made in white Oak with Walnut detailing, the inner lattice framework is a made up of 63 pieces of Oak with 126 individual mortice and tenon joints. 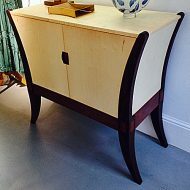 Delicate Walnut handles bring a touch of contrast to the solid Oak drawers while the solid outer framework gives a feeling of solid stability to the overall piece. Matthew Tradgett will be displaying a Spirit Cabinet made from Indian rosewood, American walnut, European sycamore with Santos rosewood and Ebony detailing.